On March 16th some of the Imperial servants who had been in Petrograd came back on foot, and we learned from them that leaflets, announcing the Emperor's abdication at Pskov, were being distributed to people in the capital. At first no one in the Palace could believe this terrible news. It seemed incredible; and how could the Emperor be at Pskov, when the last that had been heard of him was that he was on his way from General Headquarters to Tsarskoe Selo? Late in the afternoon the Grand Duke Paul came as the bearer of bad tidings to the Empress. Count Benckendorff had already warned her of the rumours reported by the servants, but she also had refused to believe them. The Grand Duke, however, had come to confirm the news, which at first she found it almost impossible to grasp. The Grand Duke was, Count Benckendorff told me, terribly upset and very apprehensive as to the future. The uncertainty of the whole situation seemed bound to lead to disaster. After dinner I went with Count Benckendorff and Count Apraxin to the Empress. We wanted to assure her of our personal loyalty. The Empress received us in her daughters' schoolroom. 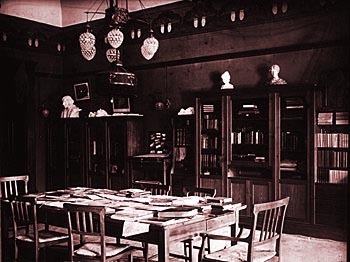 Above: Classroom of the Grand Duchesses in the Alexander Palace. She was deadly pale and supported herself with one hand on the schoolroom table. I could not think of any words in which to say to her what I felt, and when the Empress kissed me, I could only cling to her and murmur some broken words of affection. Count Benckendorff held her hand, tears running down his usually immobile face. The Empress spoke to us in French - neither Count Benckendorff nor Count Apraxin could speak English - translating, as she often did, unconsciously from English: "Cest pour le mieux. C'est la volonté de Dieu. Dieu donne que cela sauve la Russie. C'est la seule chose qui signifie." Before we shut the door we could see her sinking into her chair by the table, sobbing bitterly, covering her face with her hands. Late that same night the Manifesto of the Grand Duke Michael was brought to us by the servants. In this he refused to take up the reins of government before a Constitutional Assembly had decided what the future form of that Government should be. This was the starting-point of chaos. In one moment all the structure of the Empire was broken down. There was nothing to which the nation could cling. What had begun as a military revolt, supported, it is true, by the general discontent caused by the mismanagement of a weak Ministry, led to complete disaster. The strong monarchist element that still existed both in the country and at the front had now no rallying point, while the revolutionary elements profited by the general confusion to take the power into their own hands. In one of her notes to me at this time the Empress wrote: "It is a merciful Providence, that fits the back to the burden. "At the moment when her fears for the Emperor were most acute, her children's health began to give her the gravest anxiety. Tatiana Nicholaevna was suffering terribly from her ears, and had, temporarily, become quite deaf. Anastasia Nicholaevna also had abscesses, and her ear drums had to be pierced. Brave little Marie Nicholaevna had fallen ill too. During that agonizing day she told me that she felt that she was "in for it." I implored her to go to bed, as she seemed to be very feverish, but she would not think of doing so "till Papa was back," and swore me to secrecy as regards the Empress. I agreed to say nothing on her express promise that she would not go out of doors. Marie Nicholaevna could not wait for the Emperor's coming, however, before giving way. She had caught cold while the rash was coming out, and developed double pneumonia. She lay at death's door, her temperature always 104F, and in her fevered dreams she was haunted by imaginary soldiers all coming to kill her mother! Rumours reached us that the Emperor had left Pskov, where the abdication had taken place, presumably for Mohileff, but everything we heard was vague. I had never seen the Empress in such distress. She did not put her fears into actual words, but she was tormented by the dread that the Emperor had been murdered. She could not believe that, after his abdication, he would be still prevented from giving her news of himself, or from inquiring after his children. She hid everything from the children themselves-they were indeed too ill to realise anything, and as their rooms were darkened they could not see her tell-tale haggard face. At our daily interviews I could feel the force of her suppressed anxiety. "There is nothing I would not do! Let them kill me, put me in a convent-only that the Emperor should be safe and should be with his children again," she wrote to me. Her chief sorrow was for the loneliness she knew he must be feeling at such a moment. These were her moments of weakness. "God will help, He will not leave us," she said. Her faith came to her rescue. Gradually out of that terrible mental suffering she gained a serenity in which she could bear anything, and could be, in fact, a support to all those round her. There was one night when Marie Nicholaevna was so ill that Dr. Botkin wanted me to warn the Empress that he feared she would not live. I refused to speak to her about it, saying that Her Majesty knew enough of illness to realise her daughter's danger, and I would not cause her extra suffering by putting it into words. I was right in this, for that night was the crisis in the illness and the Grand Duchess's strong constitution pulled her through. In one way, the children's illness was a help to their mother, for it absorbed her thoughts and kept her constantly busy. On the other hand, had they not been ill, the whole Imperial Family would probably have left the country at the very outbreak of the Revolution. It was not till March 17th that the Empress got a telegram from the Emperor announcing his arrival at Mohileff. Here he was to hand over the military command to General Alekseyev, and to see the Dowager-Empress. Much though the Empress must have longed to be in her mother-in-law's place, she still said gratefully that she thanked God "that he had his mother with him." Later on the same day the Emperor was allowed to telephone to his wife. Volkov, her old page, told me that she ran down the stairs like a girl when she heard that the Emperor held the line. Their conversation was short, listeners at both ends preventing any intimate conversation. They only spoke of the children's health, the Emperor merely opening the conversation by saying "You know?" and the Empress replying "Yes." The Emperor was also able to announce his early return to Tsarskoe Selo, which took the greatest load from the Empress's mind. But from this time a premonition of dire calamity began to grow upon her. Little by little news sifted through from Petrograd, as it was still possible to keep up telephonic communication on the private line to the Winter Palace, though the ordinary telephone had been cut off. In this way we heard of the murders of police, and of officers by their men in barracks, of the burning of law courts and police stations by the escaped and liberated prisoners who took care to destroy all the police archives in which their own past misdeeds were recorded. Many private houses had been set on fire - among them that of old Count Freedericsz, his eighty-year-old wife having been carried out only just in time. There was constant feat that the maddened and drunken hordes of soldiers would come to Tsarskoe and vent their fury on the Empress and her children. There was no sleep for anyone in the Palace during the first nights : no one thought of meals. There were constant alarms when motor lorries full of armed soldiers stopped in front of the locked gates of the Palace. For three days the courtyard looked like a camp. The men, fully armed, warmed themselves at open fires, and field kitchens smoked, where the regimental cooks were preparing the men's meals. It became more and more difficult to cater for them. The provisions in the Palace, as well as those in the Cossack barracks, were becoming exhausted. The water supply had been cut off and water could be got only by breaking the ice on the pond. The situation could not last, and with the abdication of the Emperor the state of siege was brought to an end. When this news was known, it caused the deepest dejection among the faithful members of the Palace Guards. There was nothing they could do now, they felt, but to show their allegiance to the Provisional Government that had been formed by the Duma from among its members. During that night one detachment of soldiers after another left for the capital. In the morning, when the reliefs came round, they found their predecessors gone, and they, too, melted away. Count Benckendorff realised the danger to the Empress if she were left wholly unprotected, and persuaded Her Majesty to ask the Provisional Government to take some measures for the safety of the Imperial Family. The Emperor's A.D.C., Linevitch, who now was also at the Palace, went with a white flag to Petrograd on this mission, but though he had been promised that lie would be able to reach the Duma, he was arrested on arrival and unable to deliver his message. At Petrograd nearly all the members of the Cabinet had been arrested, and at Tsarskoe Selo the same fate befell the higher Palace officials. Finally Count Benckendorff managed to get' into communication by telephone with Rodzianko, and on the 18th of March the latter sent the newly appointed Minister of War, Gutchkov, and General Kornilov to Tsarskoe Selo to see how matters stood. Gutchkov came late at night, accompanied by a large retinue of suspicious looking men, who went everywhere, abusing the servants for working for the oppressors and reviling the suite, whom they described as "bloodsuckers." The Empress had telephoned to the Grand Duke Paul to be present at her first interview with the representatives of the new Government. The Grand Duke came, and towards midnight the Empress and he received Gutchkov and Kornilov. They asked the Empress if she had everything she wanted. She said she had all she needed for herself and her children, but asked that her hospitals at Tsarskoe Selo should be kept up and their needs attended to. After this visit, Gutchkov made arrangements for a guard at the Palace, and at Count Benckendorff's request appointed an officer to be an intermediary between the Government and the Palace. From this time, little by little, the soldiers seemed gradually to cease being guards and protectors and to become gaolers. Before the town telephone was cut off, some people sent messages of sympathy to the Empress and inquired after the children. There were not many of these inquiries, but the Empress's gratitude for them was extreme. Too many people to whom she had been kind in the time of her prosperity were neither seen nor heard of. Many more did not answer the letters that the Grand Duchesses wrote to them later, fearing to be compromised by association with the Court. Even one of the children's doctors felt it necessary to sever his connection, and sent a message to say that he did not consider himself a Court doctor any longer. How different was the conduct of another doctor, a man who had never attended the Grand Duchesses before, but who came to Tsarskoe Selo during the worst days and offered his services; and that of the Emperor's dentist, Dr. S. S. Kostritsky, who later came all the way from the Crimea to Tobolsk, at great personal danger, to attend his old patient. On March 20th, when the trains were running again, Captain D. V. Dehn, also an A.D.C., came from Petrograd to place his services at the Empress's disposal, offering to come with his wife (née Scheremetiev, a distant relation of the Emperor's) to live in the Palace. The Empress gratefully accepted this offer, but as Captain Dehn was leaving the Palace he was arrested and not. allowed to return. Princess Obolensky, the Empress's former lady-in-waiting, arrived about this time with the same offer, but was not allowed to stay in the Palace. Madame Voyeikov and Countess Sophie Fersen also came to express their sympathy. These evidences of friendship comforted the Empress, but how few they were compared with the many who were silent! The officers of the regiments that had formed the Palace Guard were faithful to the last. When they were ordered away, they all came to take leave of the Empress, and some of the Cossacks wept bitterly. An incident that struck us as being particularly characteristic of the tragedy of the moment occurred immediately after the news of the abdication was known. Looking out of the window, I saw dimly through the falling snow a small, bedraggled group of horsemen, parleying in front of the great closed gates. Horses and riders looked dead beat, the animals were hanging down their heads from sheer weariness, while the men still tried to keep up a military bearing. After the conversation had lasted some time, I saw them move slowly away. This was a reserve squadron of the Chevalier garde regiment, which was stationed at the Muraviev barracks near Novgorod, some 150 versts from Tsarskoe Selo. On hearing what was happening at Petrograd, the young officer in command set off with his men for Tsarskoe Selo. They rode for two days with hardly a stop through the bitter cold, over roads deep in snow. Men and horses were nearly exhausted when they reached their goal. At the gates of the Palace they were told that they had come too late. There was no longer an Emperor. There was no monarchy to defend. They rode away, the picture of utter dejection. The Empress was unable even to send them a message of thanks, though their loyalty was one of the things that she never forgot. It was especially hard for the Empress, with her inherent belief in the goodness of human nature, to bear the bitter disappointment that she felt in the change of attitude of those she had thought of as friends. But she still kept the conviction that it was not the whole country that had turned, and that there were still many people loyal to the Emperor, who could not show what they felt. Of the members of the Imperial Family at Petrograd only a few showed any sympathy to the Empress. The Grand Duchess Xenia wrote her sister-in-law a letter full of affection, the Grand Duke Paul was chivalrous and kind, and he and his wife, Princess Paley, offered the Empress the use of their house at Boulogne, in case she should want it. The Empress was grateful for the offer, but it gave her a shock to realise that, in addition to everything else, it might be necessary for them to leave Russia. 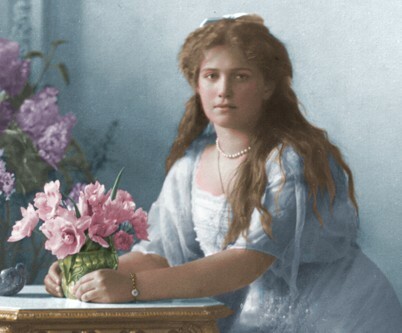 The aged Queen Olga of Greece and her niece, Princess Ioan of Russia, continued to come to the Palace for as long as they were allowed, and whenever possible they wrote and sent flowers to the Empress. The Grand Duchess Serge was in Moscow, not allowed to leave the precincts of her convent and not able even to communicate with her sister. On March 21st, the day before the Emperor's return, General Kornilov came to put the Empress officially under arrest, by order of the Provisional Government. The Empress received him in her green drawing-room, dressed as usual in her nurses' white overall. When he read her the order of arrest, she said she was glad that the task had fallen to him, as he himself knew what it was to be a prisoner (General Kornilov had been a prisoner of war in Austria), and she was sure he would know what she felt. She repeated to him the request she had made to Gutchkov about her hospitals and ambulance trains, and asked ,that the servants in attendance on the invalids might be allowed to stay, saying that now she was only a mother looking after her sick children Count Benckendorff, who was present, said that her dignity was wonderful during this interview. Kornilov told Count Benckendorff that all those who wanted to stay with the Empress would also be placed under arrest and would share the same regulations. Those who preferred to remain at liberty must leave within twenty-four hours. The Benckendorff's, Mme. Narishkin, Mlle. Schneider, M. Gilliard, and myself said we would certainly remain, as did Countess Hendrikov, who arrived from the Crimea the next day. General Ressine left, as his regiment had failed to elect him as their commander. Count Apraxin asked for permission to stay for a couple of days and then left too, considering that he could be of more use to the Empress if he were looking after her affairs in the capital. The Empress awaited the arrival of the Emperor with the greatest impatience. He was expected the day after her arrest. The first realization of changed conditions was felt when she asked to have the usual Te Deum sung in the Palace Church for his safe arrival, and the request was refused. The Alexander Palace was now completely cut off from the outer world, as I was told by the girl at the telephone exchange, when I tried to send a message of thanks from the Empress to a lady who had inquired after the children. All the entrances to the Palace, except one, were securely locked and sealed, the keys being in charge of the newly appointed "Commander of the Palace," a former Lancer, Colonel Paul Kotzebue, who was in a very difficult position. He was being spied upon by the soldiers, who were becoming very undisciplined since they had acquired their "rights," and at the same time he could not forget that he was one of the officers of the Empress's regiment. He was courteous to the Imperial Family and did his best to smooth matters, but the soldiers were really the masters, and he had to be guided by their moods. The Empress had now the difficult task of explaining to the children what had happened, so as to spare the Emperor when he came. She asked M. Gilliard to tell the little Tsarevich, while she herself told her daughters. The children were as brave as their mother, and not for a moment did they think of anything except how to help their parents. Though they were still weak from illness, they all mastered their emotion while she was with them. Tatiana Nicholaevna was still so deaf that she could not follow her mother's rapid words, her voice rendered husky with emotion. Her sisters had to write down the details before she could understand. No one knows what they said to one another when they were alone, but when the Empress came back to them, the four girls did their best to cheer her by speaking with joy of the Emperor's return on the morrow.